For the eighth year in a row GKH fielded a strong team in the Race Against Racism. At the 2017 Race, held Saturday, April 29, a total of 34 GKH attorneys, staff, family members and friends joined the crowd of over 2,400 runners and walkers in the annual event sponsored by the Lancaster YWCA. The GKH team boasted many family units, and included children in a stroller and a carrier. “We were pleased to have a large group participate in the Race again this year. This event brings people together to support a great organization and to foster a sense of community and empowerment. 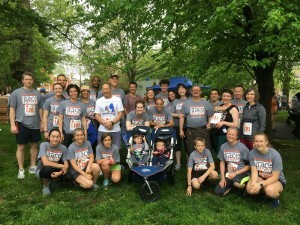 We appreciate the good work the YWCA does through its social justice and reconciliation programs and are proud to support these programs by sponsoring and participating in the Race Against Racism,” said attorney (and runner) Dwight Yoder. Again this year GKH was a Freedom Sponsor of the Race, which brought in more than $100,000 in sponsorships and donations in support of the YWCA’s social justice and advocacy programs.